Never being one to not offer my opinion, I replied adding my two cents. I was surprised to get a reply asking why when she read my reply she understood what I was saying and all the rest of the responders spoke in “geek speak”. That was flattering. Here is a link to Lori’s question and the answers she received. We had a telephone conversation and discussed what she wanted to achieve with her blog. She had written a very funny book during her journey through the world of fertility treatments. It was a very stressful time and being a comedian, laughter was the best medicine for her. She wanted to share that with others going through the same experience. Her challenge was to build an audience so that when she ultimately published the book she would have readers. I walked her through the set up of the blog and coached her on blogging. During this time I was taking an online course in social media through VA Classroom. My final assignment for the course was to prepare a social media action plan and Lori willingly agreed to my request to use her book as the subject of the project. 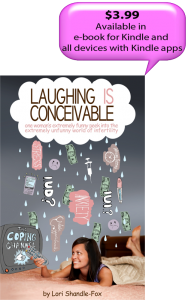 Fast forward two years and Lori has now published “Laughing IS Conceivable” as a Kindle ebook available on Amazon. We have just completed a new website for the book with links to Lori’s blog. The purpose of the site is to drive sales for her book. The main page contains an image of the book with a link to purchase the book on Amazon and reviews by experts in the fertility area. Some of the reviewers have written books on the subject and we have provided links to their books on Amazon. “I highly recommend Silver Maple Web Design and Development. I was so impressed with their service and professionalism two years ago when they completely built my WordPress blog site from the ground up, that I recently had them do a second business site for me. I’ve found them very pleasant and easy to work with. They complete assignments quickly and accurately, something which you should assume to be the case but I’ve unfortunately dealt with other web designers etc who did not return emails in a timely fashion, did not have a quick turn-around or did not do the work as discussed. Julia is always willing to take the time to work with me to get the assignment completed. There have been more times than I would like to admit when I have sent her an email with the word “HELP!” in the subject line. She has always made herself available when issues have arisen or changes or additions had to be made to my site with little notice. Check out Lori’s new WordPress website and while you’re there why not click on the link to see her book on Amazon. Were her fertility treatments successful? You’ll have to read the book to find out. This entry was posted in Our Client's Websites, Web Design, Web Development, WordPress and tagged author, blog coaching, fertility, WordPress, wordpress coaching. Bookmark the permalink.